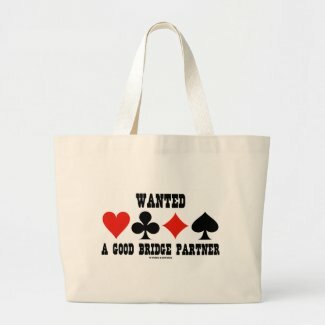 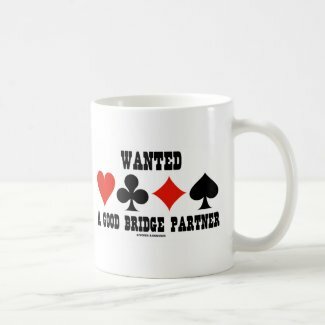 Showcase your wry side whenever you play bridge in bridge tournaments with any of these gifts featuring the four card suits along with the bridge saying "Wanted - A Good Bridge Partner". 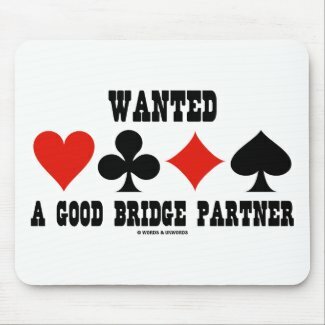 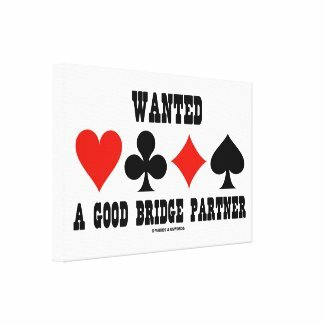 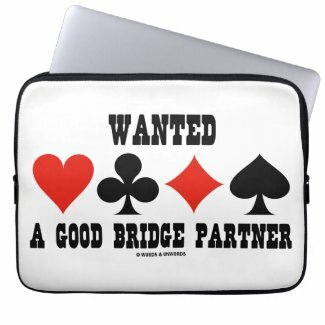 Make others do a double-take at what you mean when you search for a partner at the partnership desk the next time you play in a bridge tournament! 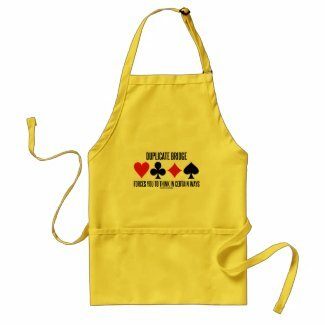 Tongue-in-cheek duplicate bridge attitude gifts for any avid bridge player! 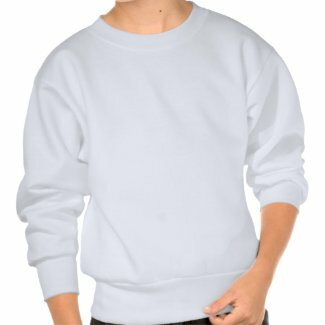 Create unique photo pendants from Zazzle. Make a t-shirt online at Zazzle. 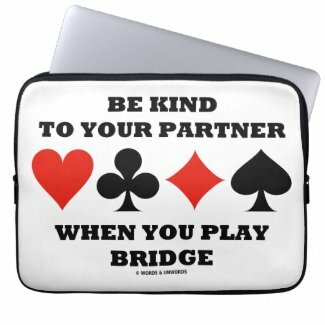 Showcase your wry bridge player / duplicate bridge player side with any of these gifts featuring the four cards suits along with the following sound bridge advice "Do Not Claim Until You Know For Sure". 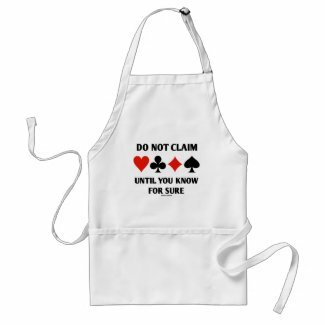 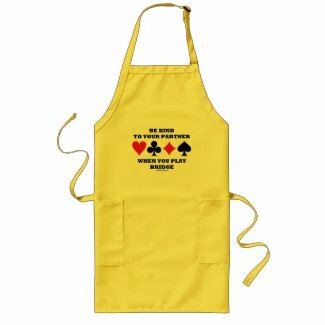 Design personalized kitchen aprons on zazzle. Make your own business cards online at Zazzle. 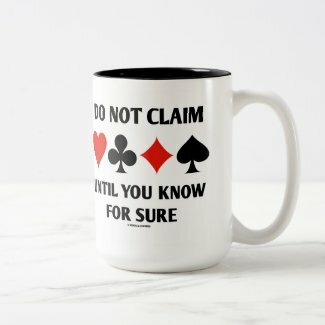 Customize your mug at Zazzle. 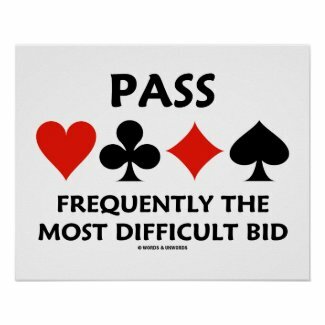 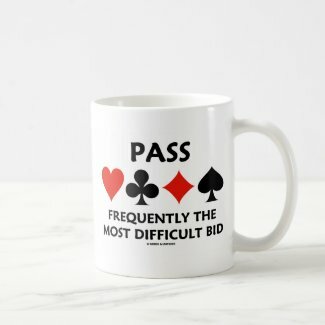 Showcase your wry sense of duplicate bridge humor with any of these gifts featuring the four card suits along with the truism saying: "Pass Frequently The Most Difficult Bid". 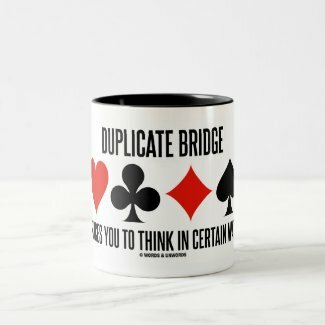 Let others know that you understand the conundrum involved in bidding your bridge hands with a dose of bridge attitude today! 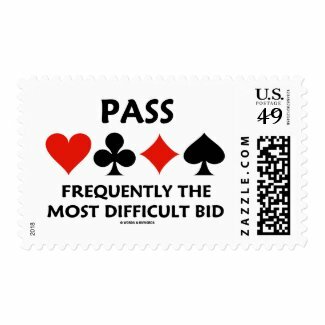 Design your own personalized mailing stamps from zazzle.com. 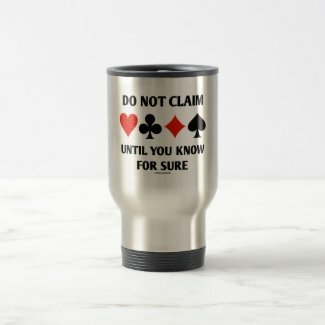 Browse Zazzle for a different candy dish. 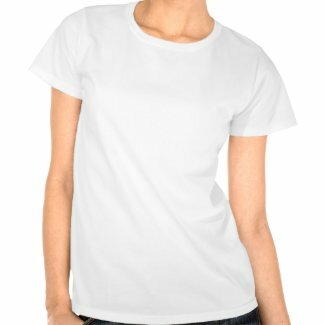 Design your own personal shirts online at Zazzle. 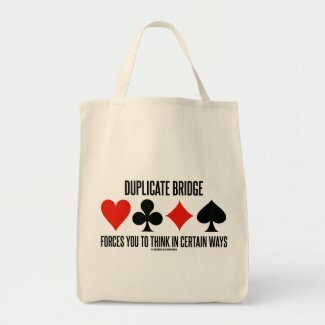 If you are a duplicate bridge player, you'll enjoy any of these wry duplicate bridge saying gifts featuring the four card suits along with the sound bridge observation: "Duplicate Bridge Forces You To Think In Certain Ways". 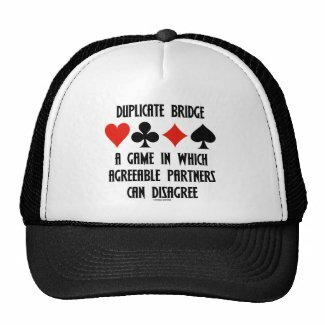 Make others do a double-take at how duplicate bridge players think when playing the game of bridge! 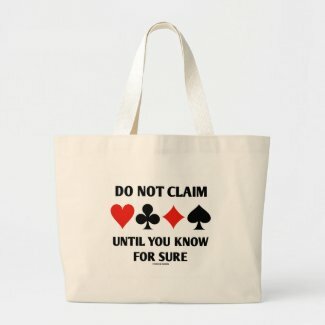 Create your own cheap personalized tote bags. 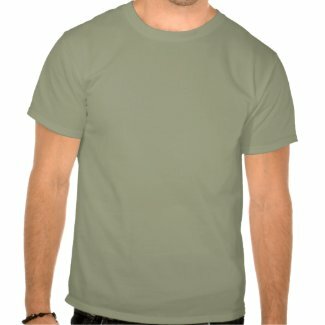 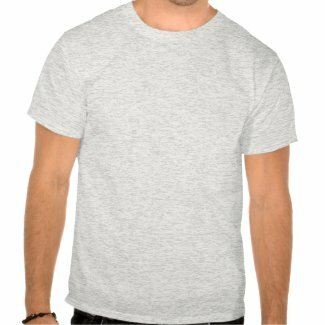 Make your own t-shirt at Zazzle. 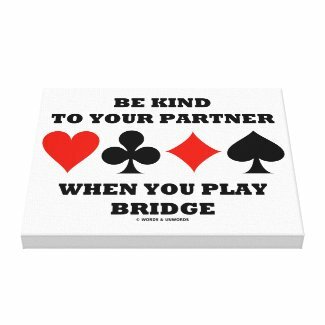 Bridge players of all ages and skill levels will enjoy any of these bridge saying gifts featuring the four card suits along with the following sound bride advice: "Take A Detour From The Ordinary Play Bridge". 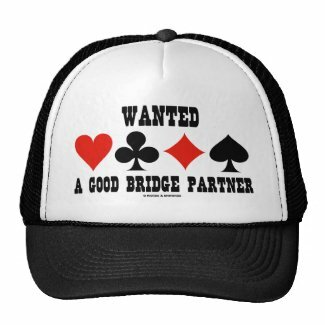 Make your own personalized hats online at Zazzle. 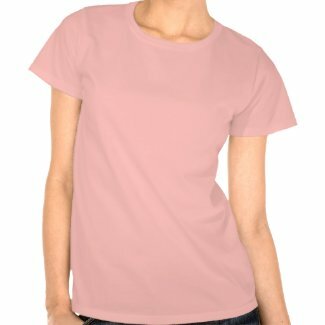 Create a tshirt on zazzle. 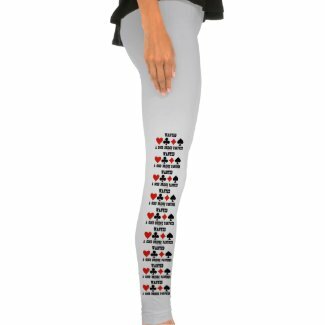 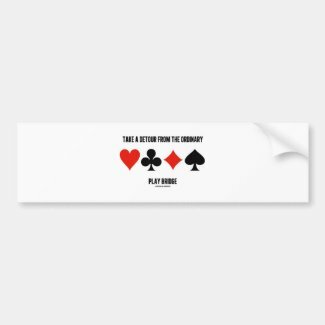 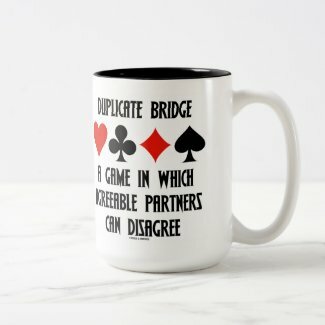 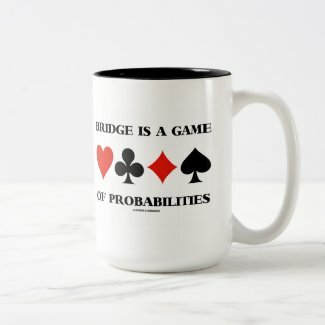 Showcase your wry bridge / duplicate bridge attitude with any of these gifts featuring the four card suits along with the bridge truism saying "Bridge Is A Game Of Probabilities" . 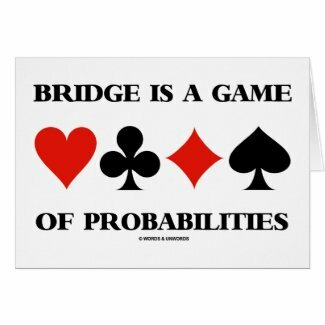 Make others do a double-take at what the game of bridge is all about with a dose of bridge humor today! 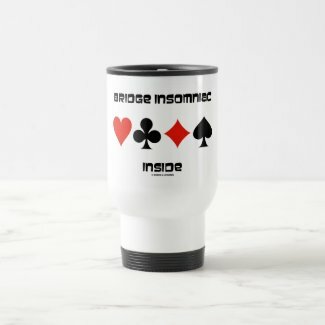 Design a unique personalized coffee cup from zazzle.com. 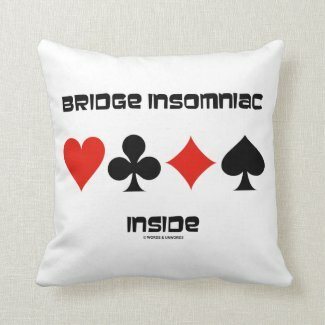 Do you stay up late playing bridge and can't get to sleep as a result? 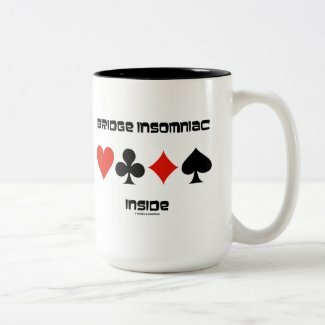 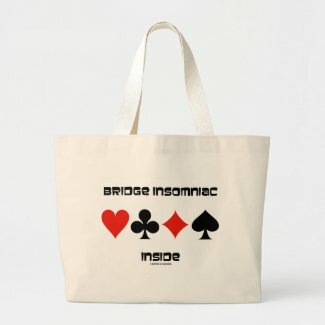 Showcase your wry bridge sense of humor with any of these gifts featuring the four card suits along with the saying "Bridge Insomniac Inside". 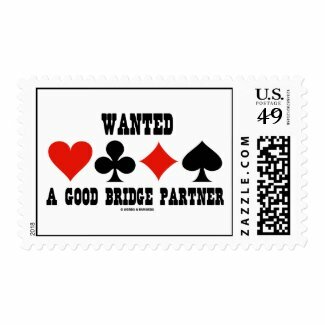 Make custom us stamps on zazzle. 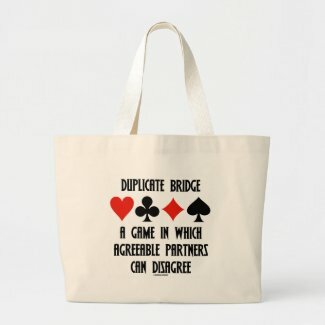 Showcase your wry duplicate bridge humor side with any of these gifts featuring the four card suits along with the saying "Duplicate Bridge A Game In Which Agreeable Partners Can Disagree". Make everyone do a double-take at the bridge table with a dose of bridge attitude today! 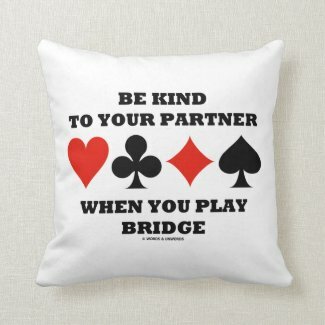 Bridge players and bridge partners of all ages and experience levels will enjoy any of these bridge saying gifts featuring the four card suits along with the saying "Be Kind To Your Partner When You Play Bridge". 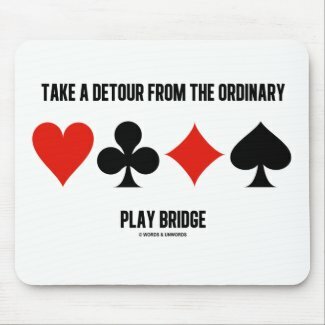 Showcase your bridge attitude with a dose of sound bridge advice the next time you play bridge! 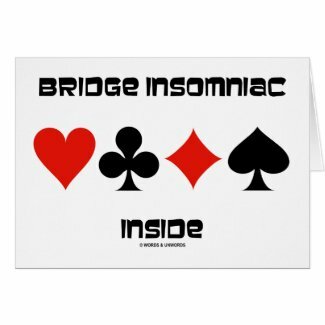 Get the best printing on canvas at Zazzle.